I spent the extra cash and saw it in IMAX because everyone said that was the way to see it. It probably is. I don’t have it in me to do a full review but I did want to get a few thoughts down. First the images are incredible. 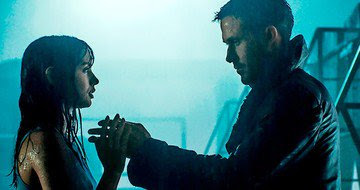 Hopefully they will get Roger Deakins his Oscar. They are so good that that they often carry the story and set the mood which the script often forgets to bring to the table. The performances are quite good. This is possibly the best role Ryan Gosling has had. The script is okay. The plot is such that the film doesn’t need to be almost three hours long. This is a classic noir tinged with science fiction and back in the 40’s this would have run half as long. This is a mood piece. The script picks up some ideas from the first film and few new ones and mixes them up to mixed results. The mixed results is a result of the film often just dropping an idea or thread for another. I really like the film a great deal, but I don’t know why some people are going crazy for it? Its good but I’m not sure much beyond that, even if it has greatness in it.